Creating products that help individuals with their personal transformations since 2016, LB Consumer Goods has launched a liquid natural sweetener named Ray NoSugar that is made from pure Stevia extract. Well known for allowing the customers to cut down on excess oil without sacrificing on taste, their recent product allows people to enjoy the sweetness of beverages without piling on any calories. Made from Stevia extract, the plant leaf used in Ray NoSugar is 400 times sweeter than regular sugar and the LB group has presented the product in easy snap sachets. 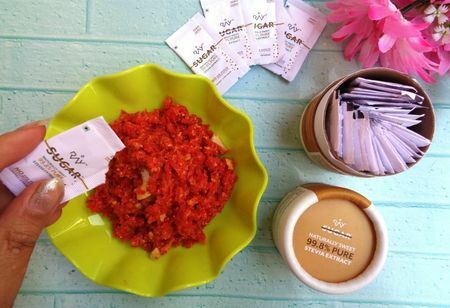 The single sachets are convenient, mess-free, and pack-in the sweetness of two tsp of sugar. It is easily available in packs of 45 Easy Snaps with leading e-commerce platforms such as Amazon, Snapdeal and Flipkart. Ray Nosugar can be used by everyone including diabetic, obese and health-conscious people, and additionally it has no added flavors, chemicals or additives and side-effects. Also, it does not contain Lactose, Maltodextrin, Dextrose, Saccharine, Aspartame and Sucralose and this helps you in maintaining a healthy body and reducing risk of type 2 diabetes and heart diseases. Consumers does not have to compromise on taste and offers sweetness in every sip, also it can be used with all kinds of beverages as it is a 100 percent natural replacement of cane sugar.